CIT Tours offers italy vacation packages and italy tours, south america packages, peru packages, costa rica packages, rome tours, sicily vacation packages, amalfi vacation packages, tuscany vacation packages, rome hotels, panama tours, argentina tours, brazil vacation packages, cooking classes and excursions to Venice, Milan, Vatican tours, Florence, Tuscany, Amalfi, Montecatini, Catania, Palermo, Siracusa, Taormina, Messina, Cinq Terres and other cities in Italy. The web server used by Cittours.ca is run by Merit Network and is located in Ann Arbor, USA. 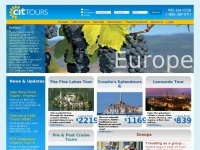 The server runs exclusively the website Cittours.ca. A Apache server hosts the websites of Cittours.ca. The website uses the latest markup standard HTML 5. To analyze the visitors, the websites uses the analysis software Google Analytics. The website does not specify details about the inclusion of its content in search engines. For this reason the content will be included by search engines.